Motivation is the force that empowers us to keep trying until we reach our goals. Any target you set can become a reality if you have strong incentives to keep you motivated until the end. Pursuing the goal of weight loss is no different than any of our other goals. Motivation is a very important parameter in your journey to lose weight. In order to be able to lose weight in the short term and be in position to maintain the results in the long term, you need to have a good plan, knowledge about weight loss topics, support and motivation. Motivation can help you overcome obstacles and get back in track when problems arise; it’s the fuel for your mind and energy for your body. Before you make a plan to achieve something, you have to be 100% sure why you want to do it. If you do not know why or you don’t have the necessary willpower it does not make sense to begin. To do something for the sake of someone else, or just because “it’s nice to do”, it will not work because you will not be motivated enough. To help you find the answer, write all the reasons on paper and try to ensure that you know why you want to start a diet or change your lifestyle. What is the most important reason: Is it because of an upcoming event? Is it because you want to buy new clothes? To become more attractive? Once you manage to clear this in your mind, you can then find ways to achieve it. 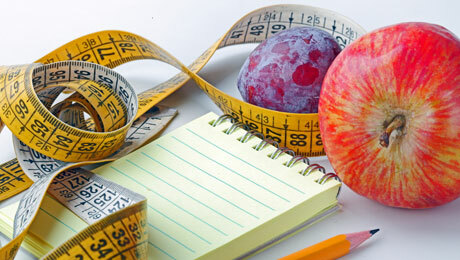 Set realistic and achievable weight loss goals. If you are overweight and you decide that you want a celebrity body in 6 months, you will surely fail. Lose weight slowly and steadily so you can maintain it. Once you succeed in the short term, your determination to lose weight will become stronger. To give up everything you love to eat from one day to the next is not a good move. Instead, reduce the consumption of your favorite treats (i.e. chocolates and ice cream) and eat plenty of nutritious foods such as fruits and vegetables. Once you get into the habit of eating fruits and vegetables on a daily basis, the easier it will become to reduce your cravings for fatty or sugary treats. Do not sacrifice all the foods you love to eat. You can eat them, but in very smaller quantities. It is important to be aware of what you eat. On a daily basis write down everything you eat and keep track of your progress. Keeping a food journal will help you understand which foods you like best, how good or bad they are for your diet and how often you should eat them. There are various activities, exercises and sports you can use to lose weight. Doing something you do not like just because it worked for someone else, sooner or later will make you lose your motivation. Do you like dancing? Try Zumba fitness. Do you like outdoor sports? Try basketball. Do you like handwork? Try gardening. There are hundreds of possible options and all you have to do is search and find out what works for you. • Find an old photo of yourself before becoming overweight and stick it in a place where you can see it every day. • In your diet journal, put a star every time you manage one of your goals and once you reach a milestone treat yourself with a massage or buy something that you always wanted. • Hang out with people who like exercise and fitness and arrange various activities with them. Setup small competitions, track your progress and compare results. • Make exercise at home while watching TV or doing chores. • Change your hairstyle and clothes as you lose weight to keep your motivation high. Do not forget that our subconscious as human beings has the power to achieve anything we want. The secret is to convince yourself that you really want to lose weight and find incentives to keep you motivated until the end.